I still struggle to know what a life of prayer looks like. I don’t think I pray all that well. It’s clumsy. It’s me-centered. It’s a list. I ramble. I get sidetracked. I get so sidetracked that I forget that I was actually in prayer. It all feels so unholy. Yet the teens in my church recently commented on how much my life centers on prayer and that inspires them. What? My life of prayer inspires them? This unholy way I pray? Maybe this is more of what prayer actually looks like? Maybe I am comparing myself to a false image of prayer? I have a lot of praying people in my life whom I greatly respect. Do they also feel clumsy and wander and ramble? My first thoughts when I heard this group of teens say this was I need to get them around so-and-so and her too. How can I get my teens close to these great praying ladies I admire so? My second thought was, Am I one of those same praying ladies? Gasp. Could it be? This prayer request came through a prayer group I’m involved in. This is how I pray (when I can get out sentences!) but I believe this person wrote it out even better. Asking for some extra extra extra prayers tonight. Just saw doc today. Hubby has a 77% blocked carotid artery and will need surgery within 2 weeks. As the doc talked he seemed quite comfortable with doing surgery and was certain all “should” go pleasantly well then came the buts. . . the reality. . .
Age, vascular disease, COPD, aorta dissection repair, hypertension, high cholesterol, kidney disease, did I mention age? All play a negative role which he had all the above. But on a brighter note he doesn’t have diabetes or cancer which were the only two on the list asked he didn’t have. So what’s the proper decision to do? Of course the surgery. There really isn’t a choice. Then once done his risk of stroke, or mini strokes, or a massive heart attack are greatly elevated. And this is only the left side for now. The right we will only watch for now since it is under 50% blocked. So they want to do this within the next two weeks. 2 weeks eeeek!!! As for me as the other half? Well reality is hitting strong right now. I’m torn. Is this my final weeks we have together or months? Is it a new beginning? My heart is trusting God however my head is all over the place. It’s easy to say ignore it but really? I tell myself to fear not, God has him and this situation. But really? Really? How many of us truly do this? Yes we trust God but the act of (trusting) is another thing all together. Of course I’m fearful, worried, scared. It’s stolen my breath, my heart beat, my ability to function. I’m not one to ever be alone. I have never ever been alone in my life. I’m not one to pretend very well. Sure like most I can (pretend) all day long until it comes to my own front door and is knocking then the real truth comes forth. I’m a scared lonely little rat hiding away from even myself. I’m like a comedian funny on the outside but depressed, lonely, and needy on the inside. Not even knowing whom I am. I’m kind, helpful, caring, and giving on the outside, overboard with it in a whole heart loving way. But inwardly I’m unassured, have very low self esteem, unworthy, lonely, scared, because of hiding away from myself and reality most of my life. I don’t know but I do know I’m one messed up individual when it comes to thinking of ever being alone in life in a few weeks, months, or years. I love this man. I need this man. I can’t live this life alone! No not ever. Look. I’m so pathetic I just turned this whole thing around about me and it’s not. It’s about my hubby and his illness and the news we received today. I’m sorry I’m one very distraught and messed up individual, scared, crazy, confused, and face-to-face with reality right now. We, no “HE” needs your prayers. Our lives together needs your prayers. Our true reality needs your prayers. Today an emotional bomb just went boom!!!! Thank you for hearing me out and all my craziness going on within me. 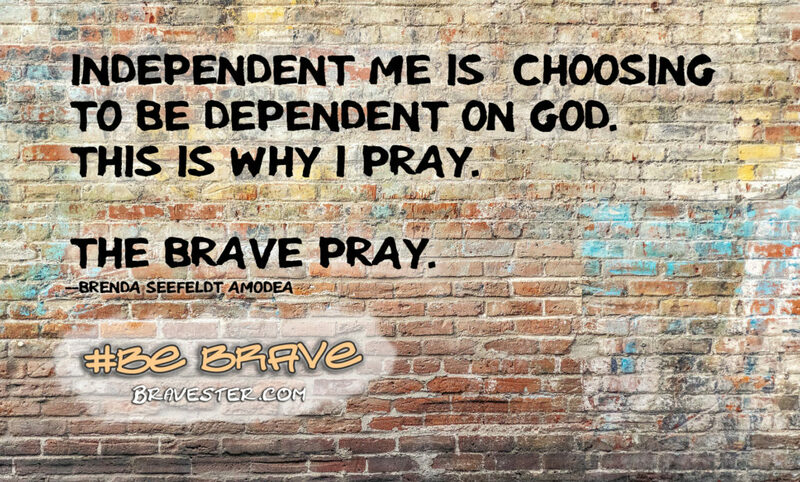 Does hearing this honesty help you to more bravely pray? I hope so. Because I believe this is the realistic truth about prayer. We often don’t make sense and God hears us anyway. Our intentions of what we are praying for are one thing but our soul is praying for something entirely different. And often selfish. I believe that God simply delights in hearing us. And God delights to hear us not make sense because in that not making sense we are actually trusting him to do something. The Lord detests lying lips, but he delights in those who tell the truth. Proverbs 12:22. My ramblings, my clumsiness are the truth of my soul. Prayer is our attempt to trust God to do something. Don’t you think that more often than not you discount your rambling, confusing, and selfish prayers as being rambling, confusing, and selfish because it is easier to minimize your prayer efforts than it is to actually trust God to answer your prayers? It is easier to declare that you are not a good prayer person than it is for you to actually trust God to hear you and answer your prayers? Trusting God is so hard. So brave. It does open you up for disappointment so you would just rather not. It is safer for your soul to keep God in an easy-to-understand box than it is for you to pray the truth of your soul. Yet the brave pray. The God I have come to know and love is the one who is not defined by a platitude. He (and she) is the one I bravely trust beyond my understanding. So I pray. I pray honest prayers. Honest prayers that tend towards selfishness. I think I’ve become one of those cherished praying ladies. 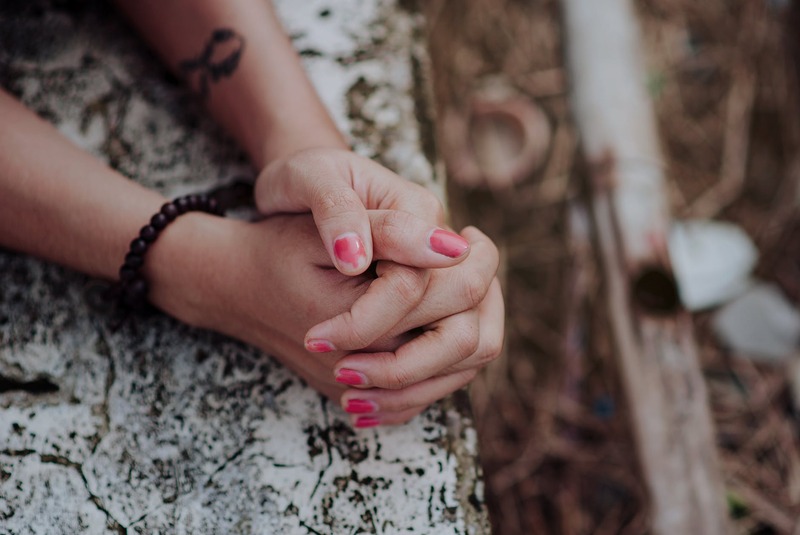 Helpful hint: When you are so overwhelmed and you have even less words to pray, try this simple breath prayer. Use it with your breaching. Breathe in and pray, I can’t. Breathe out and pray, but God can. Breathe in. Breathe out. I can’t, but God can. That’s all. And you’ve even managed to pray in a full sentence.